As promised, the FCC provided their full report on the now-defunct AT&T-Mobile merger, in which they laced their comments throughout the original proposal. What'd the FCC think? That AT&T tried to play us all for fools. AT&T made a very big deal about immediate network improvements resulting from the merger - in fact, it's been essentially the core element of AT&T's public-facing PR campaign. Yet here's another downer from the FCC: "Although we requested it, the Applicants did not provide the backup materials necessary to verify the engineering analysis of signal quality and 3G roaming improvements fron integrating the networks." The report goes on to call out apparent errors in AT&T's math and its assumptions about future cell site density that would directly lead to overstating network improvements. There's more. Much, much more. Like how the FCC found that the merger would have a serious anticompetitive effect in 99 out of 100 major markets. How T-Mobile's dogged implementation of HSPA+ actually forced AT&T to upgrade its own networks. How AT&T's economic model for how the merger would benefit all parties has "at least three basic problems that render unreliable its prediction of the consequences of the transaction." And that the transaction would result in fewer jobs, not more, at a time when the economy needs all the employment it can get. 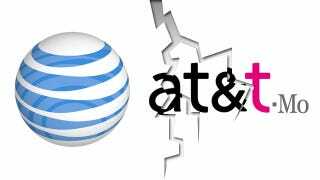 And now, realizing the rouse hasn't fooled anyone, AT&T's is now likely recourse is sneaking off into the night, more or less leaving T-Mobile high and dry (other than a $4 billion "sorry it didn't work out" payment). This proposed merger was likely one of the reasons T-Mo didn't acquire the rights to carry the iPhone, and now they're lagging behind the other three major carriers in a major way. AT&T, for their part, will do just fine with or without T-Mo. And most importantly, there will still be enough competition among carriers to keep prices in check. And that's the smartest resolution we could've hoped for. "The FCC has recognized that it is required by its own rules to dismiss our merger application. This makes all the more troubling their decision to nonetheless release a preliminary staff report on the merger. This report is not an order of the FCC and has never been voted on. It is simply a staff draft that raises questions of fact that were to be addressed in an administrative hearing, a hearing which will not now take place. It has no force or effect under law, which raises questions as to why the FCC would choose to release it. The draft report has also not been made available to AT&T prior to today, so we have had no opportunity to address or rebut its claims, which makes its release all the more improper. "